This is a double blow to the city as private water tankers stopped operations from Monday. 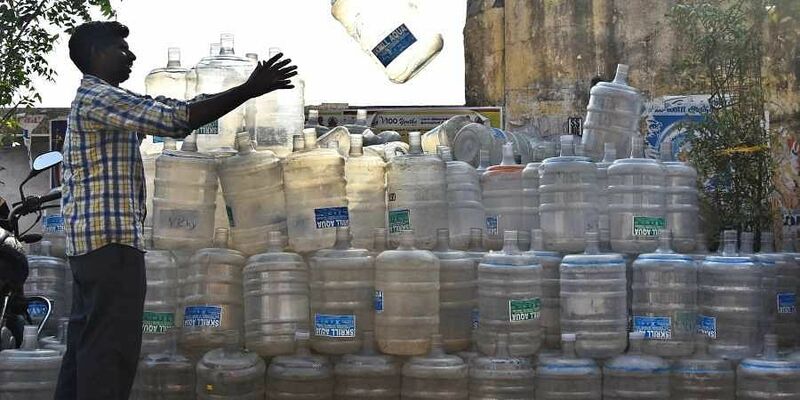 CHENNAI: Chennai may be in for a water crisis in the next few days, as packaged drinking water units in the state have gone on an indefinite strike from Tuesday evening protesting a 2014 Madras High Court order curbing illegal extraction of groundwater. This is a double blow to the city as private water tankers stopped operations from Monday. Of the 450 units that extract groundwater across Tiruvallur and Kancheepuram districts to supply drinking water in packaged cans to Chennai residents, 300-odd unlicensed units have shut following the HC order. Some 80 per cent of the city, which is heavily dependent on water cans, will bear the brunt of this development. “The HC order classifies us along with breweries, distilleries and beverage companies which extract groundwater for commercial purpose. We want to be exempt from this category as we purify and supply water only for drinking,” said V Murali, president, Greater Tamil Nadu Packaged Drinking Water Manufacturers Association. The order directed the State government to penalise those who extracted groundwater for commercial purposes illegally without obtaining proper licence. The issue flared up after revenue officials in Tiruvallur recently closed 130 borewells preventing tankers from drawing groundwater. As only 150 units carry a legal permit to draw groundwater from bore wells, packagers say demand cannot be met. Tanker associations said over three lakh workers were affected by the strike and private tankers have incurred a loss of nearly Rs 1.4 crores for not operating for a day. A Metrowater release has said the body would arrange for supply of drinking water. Residential complexes, IT companies, gated communities and hospitals along the OMR stretch from Madhya Kailash to Kelambakkam are crippled due to water shortage after 4,000 odd private tankers went off the road from Monday. Residents said they have only enough water for the next day-and-a-half. Many measures are being taken up by residents to judiciously use water. While some complexes are opening the valves only once a day, some have allowed water supply only to the kitchen and one bathroom. A few are shifting temporarily to relatives’ houses in other parts of the city. “Most complexes in OMR pump water through pressure pumps and not overhead tanks. So if we turn off the pumps and restart it after a while, there is mud and sediment in the water. The first two buckets of water cannot be used. This strike is unlike the dry spells during summer and is much more severe in nature,” said Harsha Koda, secretary of Sabari Terrace apartment complex in OMR. A Metrowater release said with a view to tackling the situation arising out of the strike by private tankers, the minister for municipal administration has ordered Metrowater to arrange for supplying water through the affected commercial establishments’ own lorries or Metrowater’s authorised tanker lorries. Consumers were asked to avail the facility by downloading the application form from its website. “A maximum of two loads per lorry in one day will supply water. Metrowater tankers will be available from 10 am to 5 pm, said the release." However, so far consumers have found Metrowater services unreliable. “I booked a tanker last night and we still have not received water. Metrowater does not have sufficient tankers to deal with this problem. The government should either allow them to extract water or take the full responsibility of providing water,” said S Geetha, a resident of Perungudi.